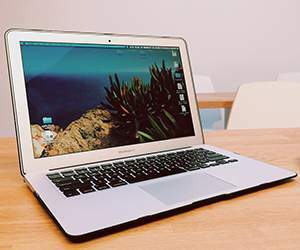 Need a new laptop for school or work, an iPad or tablet to stay connected on the go or a full home cinema system for incredible nights in? Whatever you're looking for, you can make great savings on all this and more with PC World voucher codes. Stocking everything from audio visual equipment to the very latest computers, software, accessories and more, PC World is your one-stop-shop for all your technology needs. One of the UK's largest retail chains specialising in computer and technology sales, PC World was estabished in 1991 with the founding of the first PC World store in Croydon by Vision Technology Group Limited. Through a series of expansions it became one of the country's most popular computer stores, with 163 stores across the UK and Ireland by 2006. Stores focused on educating consumers about technology, with 'KnowHow' desks staffed by experts handing out advice and 'Component Centres' offering more basic PC components such as motherboards and hard drives for DIY construction. In 2009, PC World launches their first mega-store in association with Currys, followed by 4 others across the country the following year. 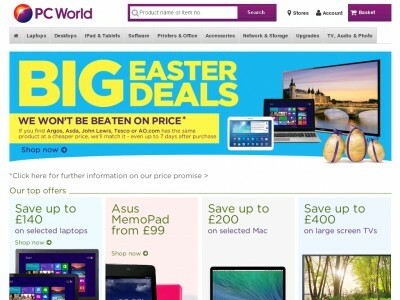 Today, PC World offers a wide range of consumer-orientated technology, including PCs, laptops, computer accessories, tablets and iPads, mp3 players, digital cameras, TVs, printers and office supplies and more. While PC World still maintains a retail presence, their website is a popular destination for savvy shoppers, with a great selection of products alongside excellent customer service features such as order tracking, buying guides and technical support providing a fantastic and hassle-free modern shopping experience. PC World has always prided itself on offering excellent value for money and now you can get even better deals with a PC World discount code. So don't miss out on your opportunity to make great savings on the latest laptops, the most fashionable mp3 player or the most impressive flat screen TV for your home cinema with a PC World voucher code! Search our website for the PC World discount code that best suits your shopping needs, then navigate to their website and begin shopping. 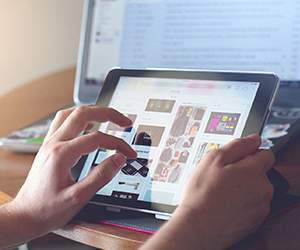 Browse the different categories to shop for laptops, desktops, tablets, software, accessories or TV, audio and photo equipment. Once you've found what you're looking for, click 'Add to Basket' to buy. When you are finished shopping, click 'Proceed to Checkout'. Enter your email address and click 'Register Now'. Fill in your details and delivery address and click 'Create Account'. Enter your PC World discount code in the box labelled 'do you have a voucher code?' and click 'Apply'. Want to find out the very latest news about PC World's products and services?Their Youtube channel is a great way to stay up-to-date with all the gadgets and technology on offer at PC World – as well as find out more about the latest offers available with PC World discount codes! Check out all the news, reviews and features on their channel. As you can see, PC World is well equipped to cater to all of your technology needs, whether you're searching for the best games console to play the latest games or a sleek, high-performance computer for work. And with the great savings that you can make with PC World voucher codes, there's no excuse not to treat yourself today! Redeeming the Argos code was so thrilling that you cannot stop looking for the best deals? Take a look at Electronics category. You will find a lot of online stores such as Currys, Pixmania which offer plenty of amazing discounts. Visit the PC World website and browse the categories of product. Click on an item to find out more. If you want to purchase, click 'Add to Basket'. Once you're done shopping, click 'Proceed to Checkout'. You'll need to make an account to finish shopping, so go ahead and click 'Register Now'. Once you've filled in your details, click 'Create Account'. Select your payment type and click 'Continue'. Fill in your payment details and click 'Confirm'. Delivery is free for all PC World Products excluding wide screen TVs over 39“. Other options include Next Day Delivery or at a time to suit. Return unwanted, faulty or damaged products at your nearest PC World store. 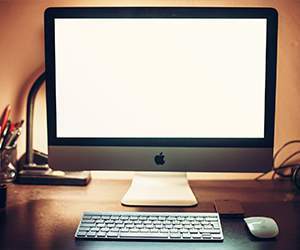 Log into your account to arrange the return of unwanted, faulty or damaged goods online. Call 08445611234 to arrange the return of unwanted, faulty or damaged goods over the phone. Want to stay up-to-date with everything that's happening at PC World? Why not follow them on your favourite social media sites? PC World has joined forces with Currys on all the major social media platforms, offering you instant access to the latest news, product reviews, great PC World voucher codes and more. Don’t forget to check them often, as a free PC World discount code might be waiting for you very soon! Buy now online at www.pcworld.co.uk/. Pcworld.co.uk is heaven if you love computers and tablets as much as I do, and the prices you’ll find there can be just as heavenly, especially if you take advantage of PC World voucher codes and PC World vouchers! My new gaming rig was considerably discounted after using a PC World voucher, and I was really pleased to watch the entire order price drop after a simple copy and paste with a PC World discount code. So before you invest in your next PC, make sure you save on it by grabbing a PC World voucher today!